See also: Albemarle and Chesapeake Canal; Dismal Swamp Canal; Roanoke Canal. Since the eighteenth century, canals and canal building have been an important part of Tidewater North Carolina history. Between the American Revolution and the Civil War, many political leaders-Hillsborough representative Archibald D. Murphey prime among them-viewed canals as the state's best hope for overcoming such natural barriers to coastal navigation and mercantile trade as shifting inlets, shallow harbors, and broad shoals. Alarmed by declining maritime trade and a high rate of outmigration in the early nineteenth century, Murphey and other progressives pinned their hopes on large canals that would allow sailing vessels to avoid the Outer Banks, as well as on smaller canals around the falls of rivers to extend shipping farther into the North Carolina interior. Some of their canal-building schemes were truly magnificent. One route that seized the General Assembly's imagination in varying guises for several decades would have linked the Chesapeake Bay with Old Topsail Inlet near Beaufort, a route that bypassed Cape Hatteras and Cape Lookout altogether. Variations called for as many as five canals spanning 90 miles. Unrealistic at the time for financial and technological reasons, the plan was a testament to how profoundly the state's boosters placed their hopes in canal building before the advent of railroads. Smaller canals, whose purpose was drainage, were vital for coastal agriculture as well as commerce, for much of the coastal plain was too soggy for farming or settlement without draining pocosins and other swamplands. Heavy ditching and canalization of wetlands has continued into the modern era as a way to make them usable for large-scale agriculture and even larger-scale monocultural forestry. One of the earliest shipping canals ever proposed for the North American continent was the Dismal Swamp Canal (initially suggested by the 1728 North Carolina-Virginia boundary line commissioner William Byrd II of Westover), a waterway to connect Chesapeake Bay with North Carolina's Albemarle Sound. This massive, 20-mile-long project was eventually undertaken between 1794 and 1805; the canal was then widened and deepened a generation later. In the same era, the Lake Company used slave labor to dig canals and drain for agriculture thousands of acres on the north side of Lake Phelps, creating the plantation Somerset Place and, just to the west, the Pettigrew family's Bonarva. Other navigation projects from the historical canal-building era include the Harlowe and Clubfoot Creek Canal, dug as a ship canal between 1795 and 1828 but never more than a workboat route between Beaufort and New Bern; the Roanoke Canal, circumnavigating the Great Falls, a 90-foot drop in the Roanoke River between Rock Landing and Weldon; the Cape Fear River canals near Averasboro and Fayetteville; and the Albemarle and Chesapeake Canal, connecting Hampton Roads with the Albemarle by way of North Landing River and Currituck Sound and serving as a competitor to the Dismal Swamp Canal. Built between 1855 and 1859, the Albemarle and Chesapeake, while employing slave labor, was the state's first canal built with hydraulic dredges rather than axes, mattocks, and shovels. Several Lake Mattamuskeet canals established communication between the vast natural lake and outer waters. An early twentieth-century canal serving the massive New Holland pumping station drained the 10,000-acre lake's waters for nearly a generation, allowing the lake bed to be farmed from the mid-1910s until the fall of 1932. A twentieth-century fulfillment of the earlier interior navigation dream is the Intracoastal Waterway, a U.S. Army Corps of Engineers project that traversed all of eastern North Carolina by 1936. Major sections of the "Big Ditch" include the Dismal Swamp Canal and the Albemarle and Chesapeake Canal as alternate routes from Virginia to North Carolina waters; the Alligator River-to-Pungo River cut; the Adams Creek-to-Core Creek cut, connecting the Neuse River to the Newport and Bogue Sound; and Snow's Cut, joining Myrtle Grove Sound and the Cape Fear River, near Carolina Beach. In the second half of the twentieth century, canals were employed as never before in important agricultural clearing and draining projects, including the 350,000-acre First Colony Farms venture of the 1970s on the Albemarle-Pamlico peninsula, as well as the smaller, but still enormous, Open Grounds Farms and North River Farms projects in eastern Carteret County. These projects drained most of the largest remaining pocosin wetlands in North America. A brief enforcement moratorium on wetlands protection in 2000-2001 resulted in a drainage spree in southeastern North Carolina affecting more than 10,000 acres. Unintended negative environmental consequences of farmland drainage have involved both the lowering of groundwater levels and the rapid runoff of pesticides and herbicides into fish and shellfish estuarine nursery areas. Even prior to the Civil War, pioneering agronomist Edmund Ruffin argued that the Dismal Swamp Canal had lowered water levels in the surrounding swamplands and dried out the peaty soils, which, when combusted, nourished unusually hot wildfires. Ironically, much of the land cleared by First Colony Farms eventually became part of the system of national wildlife refuges, the Alligator River National Wildlife Refuge and the Pocosin Lakes National Wildlife Refuge, following the same progression that saw the creation of the Lake Mattamuskeet National Wildlife Refuge after the collapse of the lakebed farming experiment. Efforts to protect estuarine water quality by restoring wetlands have been under way in that area since the early 1990s, and, as of the early twenty-first century, at North River Farms in eastern Carteret County as well. Well before the modern era of draglines and V-ditches, though, canal building was notorious for being the most miserable labor imaginable in the slave South. The old canals, still in use or merely ruins and remnants, stand as monuments to those who performed the hardest, most brutal task under the harshest conditions, working in water and struggling constantly with snakes, insects, roots, stumps, and buried trees. Peggy Jo Cobb Braswell, The Roanoke Canal: A History of the Old Navigation and Water Power Canal of Halifax County, North Carolina (1987). David S. Cecelski, The Waterman's Song: Slavery and Freedom in Maritime North Carolina (2001). Bland Simpson, The Great Dismal: A Carolinian's Swamp Memoir (1998). Walbert, David. "The Dismal Swamp Canal." North Carolina in the New Nation. http://www.learnnc.org/lp/editions/nchist-newnation/4462. 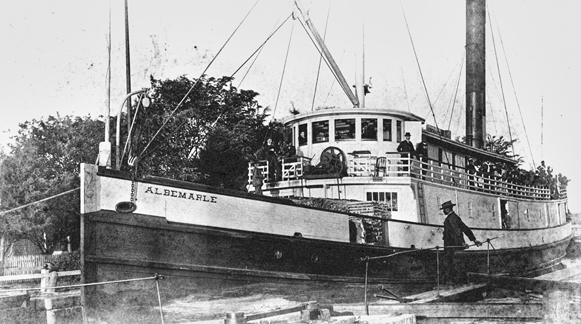 The steamer Albemarle in a lock of the Albemarle and Chesapeake Canal (date unknown). Courtesy of North Carolina Office of Archives and History, Raleigh. Unfortunately, NCpedia does not have any information about the canal. I am forwarding your question to Reference Services at the NC Government & Heritage Library. A librarian will contact you shortly to help see if there are any resources that might have the information you are looking for.